Bentley says about half its global sales are GT models, including the Continental GT V8S, pictured. 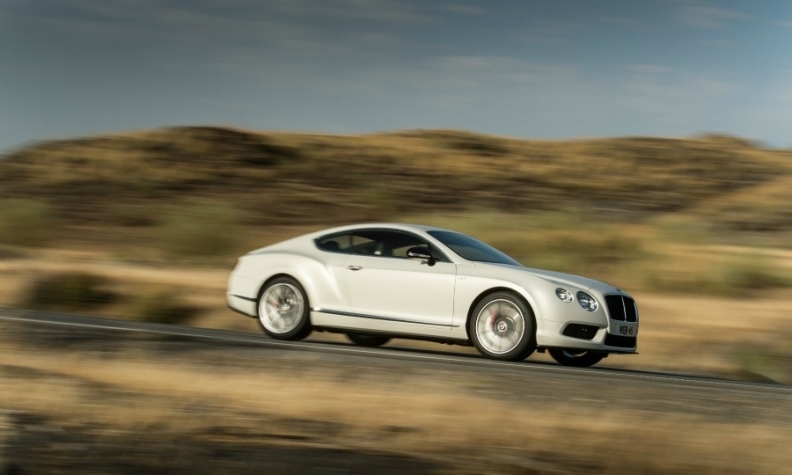 Bentley says it expects another record year for vehicle sales in 2014 as demand for its Continental GT models helps to spur global growth at the carmaker. Bentley said sales rose 19 percent to 7,786 in the first nine months, boosted by strong demand across all the company's key sales regions. Last year, Bentley sold 10,120 cars, a record for the brand. The automaker said its four key regions, the Americas, China, Europe and the Middle East, all performed strongly, with the Americas retaining its position as Bentley's No. 1 region as sales rose 4 percent to 2,107 cars. This was closely followed by China, where deliveries rose 55 percent to 1,959. In the Middle East, sales rose 21 percent to 720 cars, while European sales, excluding the UK, rose 7 percent through September to 1,155 cars. In the UK, sales were up 5 percent to 1,113. About half of the carmaker’s sales are Continental GT models, while 40 percent are Flying Spur, and 10 percent Mulsanne, a company spokesman told Automotive News Europe. In the first eight months, sales of the Continental GT range accounted for 1,087 of the 1,662 Bentley cars sold in Europe, including the UK, more than double the number of the next best-selling model in the region, the Flying Spur, which sold 438, according to JATO Dynamics. Bentley, which is owned by Volkswagen Group, is expanding its lineup in 2016 to include an SUV that the automaker hopes will help the company to hit its goal of 15,000 annual sales by 2018. The company expects to sell at least 3,000 SUVs a year. In July, Automotive News Europe reported that the automaker may add a fifth model, which could be a two-seat sports car or a model that would slot between the Continental GT coupe and the more expensive Mulsanne limousine.